This turned out to be a nice but tiring one-day trip for us. Bhimashankar was planned. Shivneri was not. I thank Lord Shiva for the detour. Lord Shiva, the God of death (Bramha is God of Birth and Vishnu is God of Life), also popularly known as Shankar (Indians love to call their Gods by many names) has presence at Bhimashankar too. There are 12 very important Shiva shrines (known as Jyotirlingas - 11 in India and 1 in Nepal) that devotees would want to visit at least once in their life time. Bhimashankar, about 125 kms. 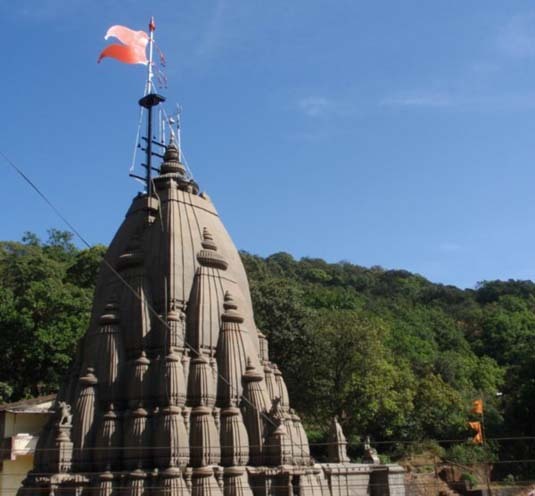 from Pune is one of the Jyotirlinga. We (my wife Vrunda, younger son Anuj and I) were more on tourism and less on pilgrimage. We set out 7 am on a sunny Sunday morning. Winter was just creeping in. Ideally we should have reached Bhimashankar in about two & a half hours, but it took us a while longer. We stopped frequently to take pictures enroute. Trust me, the journey was very picturesque. The road was good, save for few kms. of bumpy rides. But I guess that will be taken care of. I read a sign that Rs 17 million have been sanctioned for the repairs. I am hopeful that the money will indeed go into making the road good. Just a little tip. Route maps will tell you to take a left from Rajgurunagar (falling on National Highway 50; Pune to Nasik). We checked with the locals. The advice was to take a left turn further up from Manchar. You will drive about 20 kms more but the road is much, much better. Of course, bikers can ignore this little information. Once at Bhimashankar, we parked out car in the premises of State Transport. A wada-pav (potato dumpling with bread) and a hot cup of tea was very much welcome. After this quick breakfast, we were just 300 stairs up from the Shiva temple. Luckily, there was not much crowd at the temple. Be warned that on Mondays, or on special occasions like Amavasya (moonless night), eclipse days and Mahashivratri (usually falls in March; consult the lunar calendar), the lines to seek Shiva's blessings could be a mile long! We were out in about 15 minutes. We made a point to donate Rs 151/- to the temple authorities. I have been assured that the priests will perform the rudra Abhishek (chant special prayers) on a Monday (Shiva's day) for the good of my family. Prasad (sweets that have been offered to the Lord) will reach my home by post in a few days. Cool. 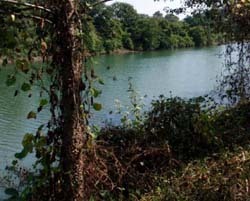 Bhimashankar is right in the middle of a wild life sanctuary. The region has the highest density of leopards in India. But that need not worry you. There are beautiful trekking tracks which is a reassurance that all has been well. I read a few advertising signs of some jungle lodges that assured good lodging and boarding facilities. The owners of the lodge can organize treks for you. No more comments as I haven't tried them. Shall keep you posted, if at all I get the opportunity. On our way back to the parking lots we walked a little distance to Bombay Point. That's right; the official sign says Bombay and not Mumbai. That was a beautiful view of the Sahyadri mountain range (incidentally, I am told that the Sahyadri range ranks amongst the top 10 hot spots of the world, the first being the Amazon; India has 2 - Himalayas and Sahyadri).Time to turn back, but not before a little hide and seek with monkeys. There were not many of them, but I am told that they do create a racket, especially if they know you are carrying eatables that are visible to them of course. So watch out. Instead of heading straight back to Pune, we realized that a detour of about 50 kms will take us to Shivneri - a beautiful fort and the birthplace of Chatrapati Shivaji Maharaj - the brave Maratha warrior-king, who ruled the region - and continues to rule the hearts of hundreds of thousands of his followers even today. Shivneri fort is a historic military fortification located near Junnar which is around 105 kms. from Pune. Shahaji Bhonsale, Shivaji's father, was a general in the army of Adil Shah, Sultan of Bijapur. He was concerned for the safety of his wife Jijabai during her pregnancy as there was constant warfare going on. 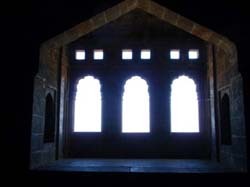 He therefore moved his family to Shivneri fort. Shivneri enjoys a highly defensible location, with steep rocks on four sides and a strongly-built citadel. Shivaji was born at the fort on 19 February 1630, and spent his childhood there. 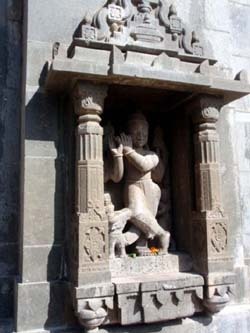 Inside the fort is a small temple of goddess Shivai Devi, after whom Shivaji was named. 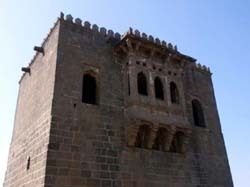 Young Shivaji acquired all the skills and training on this fort which he used while establishing hindavi swaraj (self-rule). He learnt the early lessons of swaraj on this fort. After climbing up 400 steps and crossing 7 main gates we reached the top of the Shivneri fort. A further walk took us to the birthplace of Shivaji. A beautifully architected structure. The climb and back again to our car at the base took about 3 hours. Add 3 more hours and we were home. In time for a hot shower and well deserved high calorie meal.